A bipartisan push in Colorado to fast-track natural gas exports in the wake of the Ukraine crisis has at least one member of the state’s congressional delegation calling for better environmental safeguards before stepping up domestic production. “As natural gas operations continue to expand in Colorado and across the nation, it’s important that it is done safely and responsibly,” U.S. Rep. Diana DeGette said in a prepared statement Friday to the Rocky Mountain Post. A gas rig in Battlement Mesa on Colorado’s Western Slope (David O. Williams photo). Colorado Democrat Mark Udall and U.S. Rep. Cory Gardner, a Republican challenging Udall for his U.S. Senate seat in November, introduced bills in both chambers this week seeking to speed up the export of liquefied natural gas (LNG) to countries like Ukraine – a nation largely dependent on hostile Russia for its natural gas imports. Udall says Russia’s “threat to use its natural gas exports as a cudgel [in Ukraine]” underscores the need to allow energy firms producing natural gas in the United States to export to World Trade Organization countries without a lengthy U.S. Department of Energy (DOE) approval process. He also called for quicker DOE approval of coastal U.S. export terminals for LNG. Stepped up production domestically can be done responsibly, he argues, without adverse impacts to the health and safety of Colorado residents. Four Colorado cities last November voted to ban fracking out of concern for potential air and water pollution, and last month citizen groups seeking greater local control over state-regulated drilling launched a ballot initiative. “Sen. Udall has been a longtime proponent of Colorado’s balanced approach to energy development,” Udall spokesman Mike Saccone told the Rocky Mountain Post Friday, pointing to the senior senator’s statewide energy tour highlighting Colorado’s energy diversity, from biomass to natural gas to wind and solar. Gardner, whose congressional district contains the most heavily drilled county in the state (Weld), on Thursday introduced the Domestic Prosperity and Global Freedom Act, a bill that would speed up DOE approval of LNG export applications. The Russian incursion into Ukraine’s Crimea region and the threat of war has sparked deep concern in Europe, where many nations rely heavily on Russian natural gas imported via pipelines through Ukraine. A Gardner spokeswoman could not be reached on Friday for comment on the potential environmental impacts of expanded natural gas drilling in Colorado. “Congressman Gardner’s comment — which, for the record, came several days after Sen. Udall first highlighted this issue — overlooks Sen. Udall’s long body of work supporting expediting the permitting of new LNG terminals,” Saccone said, referring to a press release on Tuesday. Saccone also pointed to several Udall comments and letters to the DOE dating back more than a year. DeGette, a Denver Democrat, has been trying to pass the Fracturing Responsibility and Awareness of Chemicals (FRAC) Act for more than five years. 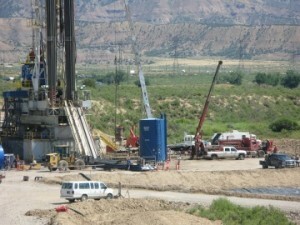 The bill would remove a Bush administration Safe Drinking Water Act exemption for the controversial drilling technique known as hydraulic fracturing, or fracking. Dubbed the “Haliburton Loophole” by critics of the oil-and-gas servicing company that developed many fracking techniques, the 2005 exemption allows companies to keep chemical fracturing mixtures secret for proprietary reasons. DeGette wants to remove the exemption and require full disclosure nationally. Colorado, the ranked sixth among natural gas-producing states, adopted a fracking chemical disclosure rule in 2011. DeGette this week pointed out that the U.S. Secretary of Energy Advisory Board issued a new report (pdf) recommending the full disclosure of chemicals used in fracking on federal land – the same approach she’s long advocated for on private land undr the FRAC Act.